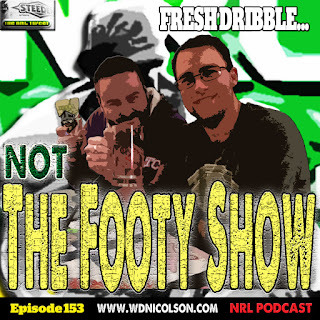 Join DC and Waz for a 2015 NOT The Footy Show Special! 26 minutes or so of old fashioned #NTFS waffle with us trying to pick the Origin 3 winner, evaluating your NRL team entering the run into September and we reveal our new sponsor* - nrlshop.com - doesn't even know they are getting a free plug! Round 17... Check your tips! Hands up if you only got Parramatta wrong last weekend? Sigh... it was bad enough changing from Parra to Saints (for the first time this year!!!) but to drop a tip in the work comp because of pure stupidity is amazingly frustrating. Game of Round 17 is Sunday Arvo at Brookie - Manly v Cronulla. Manly have their backline fit (bar Lyon - who might be a late addition) and Cronulla just beat the Cowboys in Nth Qld without Paul Gallen. They don't have Gallen or Ennis but their forward pack is going great right now... this should be handy contest. Penrith over Souths - I was a believer in the Panthers at Leichhardt... but that was against the Tigers... I'm not sold on Penrith at all in this but Joel Reddy is lining up for Souths - so Penrith it is. Dragons over Cowboys - Give me Widdop and Marshall over Lui and Thompson any day of every week... and I don't like Saints at all but no faith in Cowboys sans their stars. Manly over Sharks - This could change 85 times before Friday's cut-off... I liked Cronulla all week but Manly with Foran and DCE and a moderately okay pack... I guess I have to back them now Ennis is out despite Cronulla's pack going really good of late. But backline wise Manly are much stronger. Eels over Tigers - Tigers probably wake up... Eels probably go back to sleep... but how you tip either of these team with any serious conviction is beyond me. As for #Origin 3... heck, Farah plays I think NSW can do it... Ennis plays and say hello QLD! Last week 7/8: Only missed on Dragons... I now loathe the Dragons! Agree with my Round 17 Tips?